It's difficult to imagine a world without pets—it's sure to be less fluffy, less adorable, and overall just not fun. And whether your best friend is a dog, a cat, or what-have-you, you probably still feel just as attached when you see someone and their beloved companion on the big screen. So, we round up 10 flicks that'll make you want to cuddle up with your furbaby (or not-so-furry baby) and go on a movie marathon. 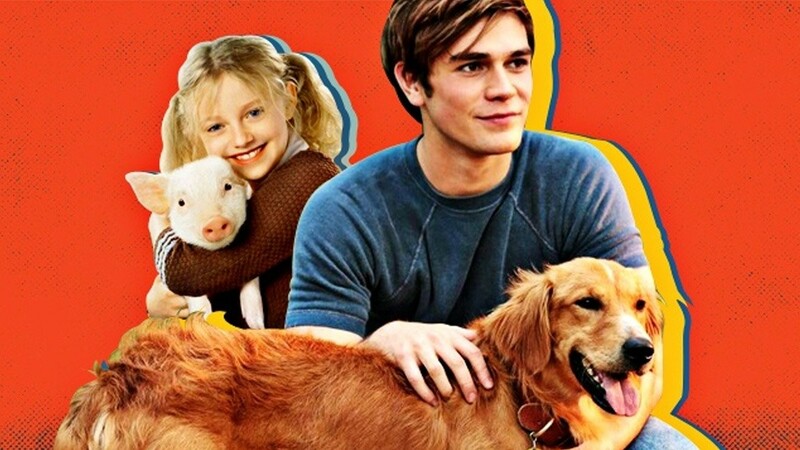 A young girl named Fern (Dakota Fanning) saves a piglet from being put to sleep and names him Wilbur. When Wilbur matures, Fern is forced to give Wilbur to her uncle who owns a barnyard—but Wilbur is snubbed by the other animals who taunt him and tell him he'll soon be served as dinner. He then forms an unlikely friendship with Charlotte, a barn spider who weaves words in her web to convince the family to spare Wilbur's life. Fern and Wilbur's relationship is heartwarming, but Wilbur and Charlotte's will make you want to cry your eyes out like you did when you were a kid. Robert (Will Smith) is a virologist who is seemingly the only non-infected human left in New York after a virus outbreak. His only companion in his day-to-day life is his dog Sam, who was given to him by his daughter before she died. Together, Robert and Sam fight their way through zombie-like humans who attack at night, all the while trying to not get infected by the virus. Newly married couple John (Owen Wilson) and Jenny (Jennifer Aniston) are planning to have a baby, but they want to know if they're ready for it by getting a dog first. And so, they select the wild and seemingly untrainable Marley from a litter of Golden Retrievers. If you can't imagine a day without your fluffy best friend, you'll find yourself bawling as the couple goes through all the ups and downs of their life with Marley by their side. Everybody already knows the heartbreaking story of Hachiko, the loyal dog who waited for his master at the Shibuya Station in Tokyo every day even after his death. It's even more tear-jerking when you see it on film—though it comes with a few changes. In this movie, Professor Parker Wilson (Richard Gere) comes across a lost puppy who was left behind after being freighted from Japan to the United States. He fails to find the dog's owner and ends up forming a close relationship with the dog, whom he discovers is named Hachi. Eventually, it becomes routine for Hachi to walk Professor Parker to the train station daily and wait for him—even if he doesn't come back. And if all dogs go to heaven, Hachi would definitely on the top of the list. Hiccup (Jay Baruchel) is expected to live up to his father Stoick's (Gerard Butler) reputation as the leader of the dragon-slaying viking village of Berk. But then he meets Toothless, a rare dragon that he attacks, but soon befriends and starts training. Hiccup and Toothless form a strong bond—but their relationship is put to the test when Hiccup is tasked with killing a dragon. Sure, dragons aren't actual pets, but it can't get any more real than when you sacrifice something for your beloved companion—fire-breathing or not. Loosely based on real-life events, Dolphin Tale revolves around the rescue and rehabilitation of a dolphin named Winter. In the movie, a young boy named Sawyer (Nathan Gamble) comes across a dolphin stuck in a crab trap. The dolphin is named Winter and she is brought to a treatment facility, where Sawyer—longing for companionship—visits her every day. Though Winter learns how to swim after her tail is amputated, it is revealed that the stress from swimming can lead to her death. Sawyer tries to find a way to save both Winter and the underfunded treatment center that's set to be sold. What'll tug at your heartstrings even more is the fact that Winter herself plays the dolphin in the movie. After his handler Kyle Wincott (Robbie Amell) is killed in battle, highly trained war dog Max is only comfortable around Kyle's brother Justin (Josh Wiggins). After realizing this, the Wincott family then adopts Max—though Justin initially doesn't want to. Soon enough, the two start forming a bond and Max soon becomes the key to finding out how Kyle really died. Max the Jack Russell Terrier (Louis C.K.) is used to being spoiled by his owner Katie (Ellie Kemper). So when Katie adopts a new dog from the pound named Duke (Eric Stonestreet), the two dogs start fighting for her attention and approval. After a fight, the two then get mistaken for strays, and they're forced to make their way around the city while being chased by Animal Control and a violent gang of former pets who were mistreated by their owners. Trying to find their way home, Max and Duke eventually find out where Duke came from and how he ended up in the pound. The movie makes for an entertaining and comedic watch, but it also makes you wish you really knew what your pets are up to when you're not at home. Based on a novel of the same name, A Dog's Purpose tells the story of a dog who is repeatedly reincarnated into a new life. He becomes a young Ethan's (KJ Apa) Golden Retriever named Bailey in the '60s, a German Shepherd police dog called Ellie in the '70s, then a Pembroke Welsh Corgi named Tino in the '80s. He remembers all of his past lives as he changes from one to the other. Eventually, he is reunited with one of his old masters as a different dog. In his pursuit of finding his life's purpose, he makes everyone else's better. In between the bucket of tears you'll be shedding, this movie will make you realize why dogs are too good for this world. When Mayor Kobayashi (Kunichi Nomura) of Megasaki decides to exile dogs to a nearby trash island, the first canine to go is Spots, the guard dog of the mayor's nephew Atari (Kayu Rankin). But Atari isn't one to give up so easily, as he flies solo to the titular isle in search of his best friend. He crash-lands, but eventually meets a pack of former domesticated dogs and their stray leader Chief (Bryan Cranston), who try to reconnect Atari with Spots. The individual stories of the dogs, their close relationships with their owners, and the cruel things the dogs go through after they're deserted and left (quite literally) fighting for their lives will make you want to hug your dog ASAP.